My great-grandmother, who was born in the 1880s, passed away when I was about 11 years old. Looking back, it is fairly obvious now that she was a hoarder on a colossal scale, but since this predated reality television, we tended just to say she was a packrat. As we cleaned out her house in rural Missouri, there was something special waiting: two boxes brimming with postcards. These were not of the “wish you were here” variety depicting washed-out hotel swimming pools and palm-tree-lined boulevards. These were older, more elaborate—variously embossed, gilded, tinseled, and extravagantly colored. They were greetings for birthdays and anniversaries, tokens of affection and romantic overture, and happy returns for every holiday on the calendar. Christmas, especially. I didn’t realize it at the time, but my great-grandmother’s collection would give me a window into the desires—and anxieties—of a world I would only later come to understand and appreciate as I pursued my doctorate in American history. Until I embarked on that journey, the cards often sat in the back of closets or under piles of other accumulated stuff. Still, every so often, I’d take them out, dust them off, and wonder at them anew. Once my long nights of historical study began, I returned to them more and more often, until they finally set me on a path of becoming a scholar of American holidays and culture, including the phenomenon of holiday postcards. It turns out there was a good reason my ancestor had piles and piles of these rectangular cardboard artifacts. For a few years in the early 20th century, postcards were a massive phenomenon. Billions of postcards flowed through the mail, and billions more were bought and put into albums and boxes. And amid that prodigious output, holiday postcards were one of the most popular types, with Christmas reigning supreme, just as it had in my inherited collection. 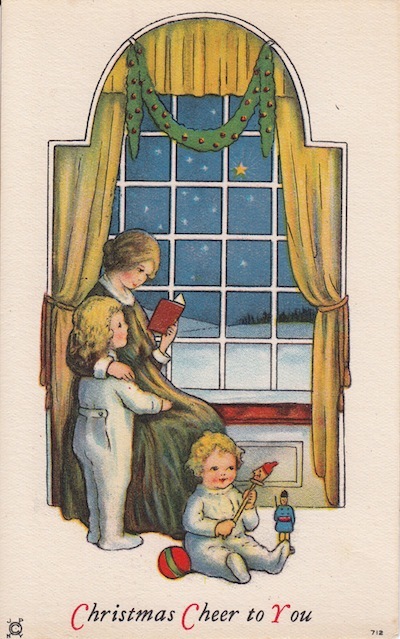 The practice of sending Christmas cards pre-dated the broader postcard craze by several decades, largely thanks to the efforts of Louis Prang. Prang was a savvy printing entrepreneur who kept adding products and lithographic techniques to his ever-expanding business, including the introduction of Christmas greeting cards (perhaps at his wife’s suggestion) in 1875. 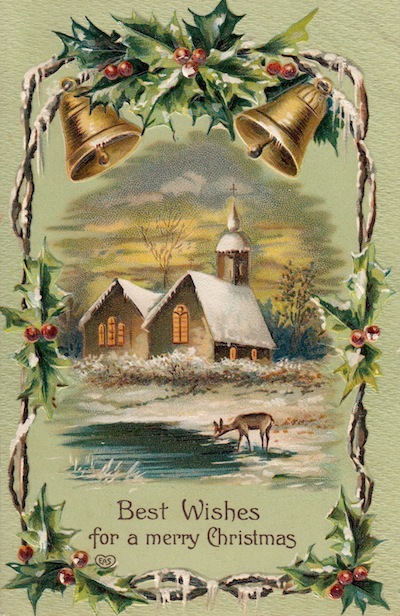 By the 1880s he was publishing more than 5 million holiday cards each year. And once postcards fell out of favor, greeting card companies like American Greetings and Hallmark rushed in to fill the void. But for a few short years between 1907 and 1910, Christmas postcards created a visual conversation between Americans that was unique because it was also very public. They were in many ways a forerunner of today’s impulse to post selfies and holiday pictures on social media. Unlike a greeting card or letter that hides its contents within an envelope, a postcard was always on display—from the rack in the drugstore where it might be purchased to its final destination. And those billions of snowy landscapes and bag-toting Santas churning through the mail system—the Rural Free Delivery system in particular—revealed much of what was on people’s minds at the height of the Progressive Era. Take mistletoe, for example. Mistletoe had long been part of the Christmas tradition, with young men using sprigs of the plant to claim the right to demand or steal a kiss. Yet this was an era when women were asking serious questions about their rights and questioning the assumed passivity of their lives in everything from courtship and marriage to education and work. This is why so many postcards feature a woman who has taken control of mistletoe, deciding when and where it will be hung, and when she will choose to be under it and for whom. 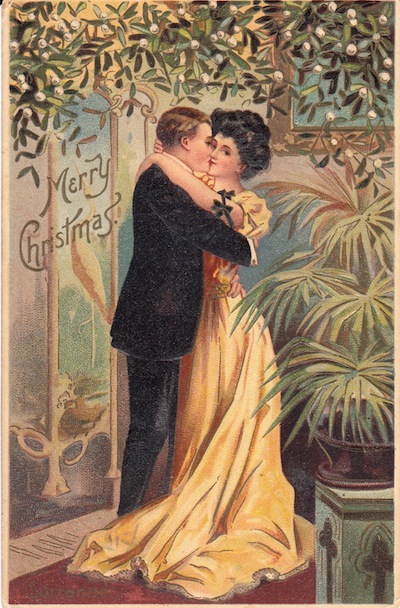 Sure, the rowdy, sprig-wielding young man still shows up in Christmas postcards, but now he must contend with the “New Woman” who uses mistletoe as part of her new right to take the initiative. Rural landscapes are another good example. On the surface, nothing seems particularly unusual about a Christmas greeting that features a little snow-covered house in the countryside. That sort of mythologized ideal has been around since before the Civil War, when Currier and Ives capitalized on rural nostalgia with their inexpensive prints. Still, rural and small-town America was far from a contented place in the first decade of the 20th century. Farm children seemed to be fleeing to cities in droves, with 1910 marking the last census of a majority-rural American population. One reason billions of Christmas postcards circulated with nary a cityscape to be seen is that rural Americans were circulating an idealized vision of themselves. When times seemed tough, all those picture-perfect fields, barns, fences, and country homes became a way to create an alternative narrative—one that was beautiful, healthy, and prosperous. One could argue this instinct shares significant DNA with the practice of staging family photographs for Christmas cards, or for today’s Facebook postings. There is something comforting and empowering about controlling the visual elements of a holiday greeting to your friends and family. Those visuals are not just representing you but a perfected version of you, and your world. These were also the years when the United States saw the peak of European immigration, particularly immigrants from Southern and Eastern European nations like Russia, Lithuania, Italy, and Greece. 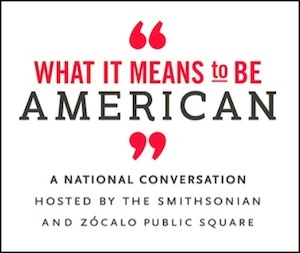 Partly as a reaction to this inflow, and its surrounding anxieties, people were eager to emphasize their longstanding roots in the country, as if to say “we came here generations ago, not yesterday.” Manifestations of this urge to claim native roots pop up in the period’s genealogical societies, colonial revival movements, and yes, holidays. An “Old Fashioned Christmas” is a phrase that appears with increasing regularity through the first two decades of the 20th century. 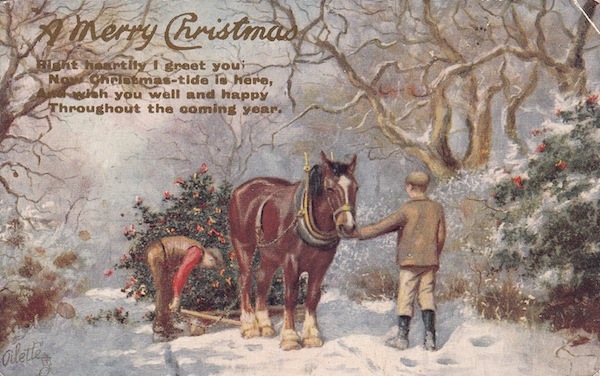 It is also a repeated theme in Christmas postcards with plenty of “ye olden time” imagery of colonial homesteads, spinning wheels, lanterns, rocking chairs, muskets, and horse-drawn coaches. The postcard fad ended when the best postcards—which were printed in Germany using superior lithographic techniques—were priced out of the market by a newly passed tariff in 1909. By 1910, interest was waning as American firms failed to produce postcards of equal quality. World War I put the final nail in the coffin. Yet whereas Halloween or Thanksgiving greeting cards never took off the way their postcard predecessors had, Christmas cards have remained an American tradition, if now dressed up in an envelope. Always a mirror of the times, popular Christmas card styles included Art Deco in the 1920s and patriotic cards during World War II. Looking back, however, there was something distinctive about the old postcards. They put it all out there—hopes, dreams, worries, excitement, wonder, fear, pride, and more—for store clerks and mailmen, nosy neighbors and family members to see and read. Certainly I wonder how my great-grandmother’s network of cousins, friends, and her future husband (who sent her plenty of courting postcards, including a few mistletoes of his own) picked the cards they sent. What appealed to them and why? As a kid my answer would have been “because they look cool,” but as a cultural historian I now look deeper for what might like beneath the surface. Like so many others who gravitated to postcards with an almost forceful passion, she was a young rural girl from a long line of rural Americans who saw the world changing quickly. Postcards were a way of dealing with those changes, some welcome I’m sure, and many not. Still, I do agree with my younger self … they were and remain pretty darn cool. For those of us whose parents or grandparents grew up during the Depression, Christmastime was not always a time of abundance. Families often struggled to survive, let alone provide gourmet meals or indulgent presents. Grandma and Grandpa built their Missouri farmhouse around 1910. The farm had ponies and chickens and cows and dogs; of course, all my dad ever talked about was how the fields were forever full of rocks and how much work they did and how certain Grandma was that the man from the bank would come and take it all away. While I was growing up, Dad shared stories of hard times during and after the Depression. Times were tough – but they had some fun, as well. For instance, on Christmas Eve, Grandpa, Grandma, my dad, and his brother, Ralph, arrived at their small country church before everyone else. Grandpa and Grandma decorated and laid out the food while the boys lit the stove and trimmed the wicks. Of course, Grandpa’s family never missed a Sunday service or a church supper. Some families were real scarce the rest of the year but no one ever missed Christmas Eve. I’ll tell you why. Picture this: After the service, Grandpa sneaks off and hides in the back room, smoking a cigarette and getting ready. Finally, when all of the children are settled on the floor trying their hardest to be real quiet, Grandma taps on the door. Suddenly, Grandpa jumps out, wearing a big hat, a funny coat, and a long, gray beard, waving his arms and shouting. “Merry Christmas! Ho, Ho, Ho! Who here has been good? Who wants a Christmas treat?” Instantly, the children begin shouting and waving. Everyone laughs and cries and runs around! Grandpa hands out hard candy from his pillowcase. Parents attempt to get their kids back under control but Grandpa grins and keeps them all riled up. I never saw it with my own eyes, of course, but I heard the story so often that I feel like I was there right in the middle of things. It turns out that the candy will be the only special thing that a lot of those children receive for Christmas. Some have no coats or hats or mittens. Every year, more families lose their land and quietly disappear. After the celebration, children stuff candy in their pockets and all of the families, except Grandpa’s, head home. My dad always thought it was kind of unfair that his family always stayed late to clean up. One year when times were particularly rugged, Grandpa told the boys very firmly that all of the treats were to go to the poor children. When they arrive back to the farm, my dad’s pockets are empty and he is feeling mighty sorry for himself. Grandpa must have been watching my dad’s face on the ride home. Now, mind you, Grandpa never, ever, wasted one kind word on his boys. Often enough, Dad was spanked hard, and, truth be told, it was a struggle for my father to tell anyone that he loved them until he was much, much older. It is the most wondrous gift he has ever received. Even years later, Dad could recall Grandpa’s laughter as he ran off to show Ralph. Dad has been gone for several years. I wish I could ask him if he reflected on his story each December as he watched our growing family open one present after another. He probably did. So, in Dad’s memory, every stocking will hold an orange and, on Christmas Eve, we will tell my father’s story about how a piece of fruit became a wondrous gift, indeed. Because, even though I never saw it with my own eyes, his story has become my story, too. Lake Effect essayist Bruce Campbell reads his essay, "A Christmas Eve Story."